Everyone needs a lesson from Disney when it comes to milking a franchisee. Kaspersky Labs in Japan has takes to Star Wars to help promote its Internet security suite. Building up on a story that along with the braveness of the resistance pilots it was weak data security on the Imperial Forces systems that led to the obliteration of the planet killer. 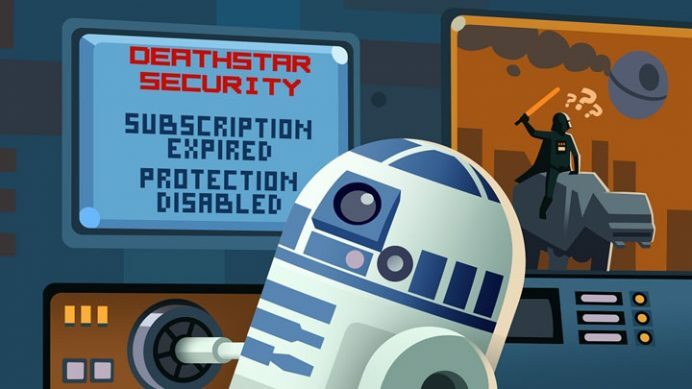 Instances like of R2D2 escaping from Princess Leia’s ship as it was captured by the Imperial forces to Hans Solo’s Millenium Falcon captured by the Death Star have been used to draw references data leaks and trojan horses. The report concludes that had measures been taken the Death Star would still be intact.